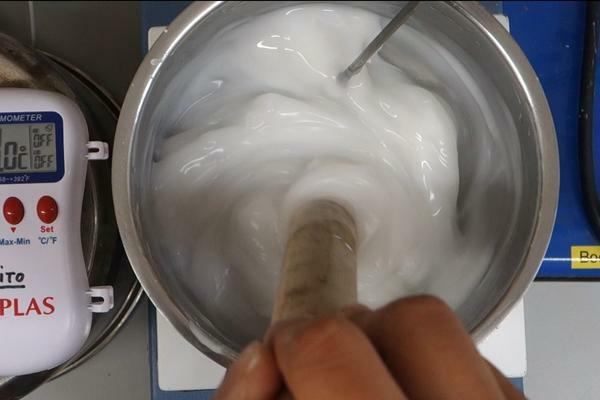 Wheat starch paste (WSP) is a versatile adhesive commonly used in paper and book conservation. Because of it degrades very quickly, WSP is not available in a ready-to-use form and each studio must regularly cook small batches in an artisanal manner. This has led to the development of a multitude of ad-hoc preparation techniques and recipes across the world. In fact, when I wrote a small blog post post about paste making in 2016, the many comments and responses I received clearly demonstrated that paste making was not an exact science but far more like cooking - with recipes and tricks passed on from conservator to conservator. 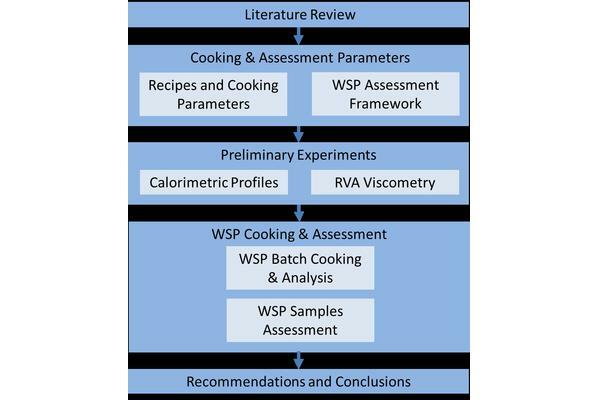 Looking further into professional publications I found out while there had been some effort to collect recipes, there had been very few attempts to establish formal criteria to assess and compare the quality of WSP across recipes. This was the inspiration for my MA dissertation: Wheat Starch Paste: A Study of Cooking Profiles and Adhesive Properties Across Preparation Recipes (available at the West Dean College Library). This first blog post will introduce the initial stages of my research; a second post will describe the paste sample testing. First, an extensive literature review was conducted, complemented by direct communications with conservation studios world-wide to explore the current state of knowledge on WSP. While some recipes were similar and could be grouped together, this research still led to 40 different "model" recipes. 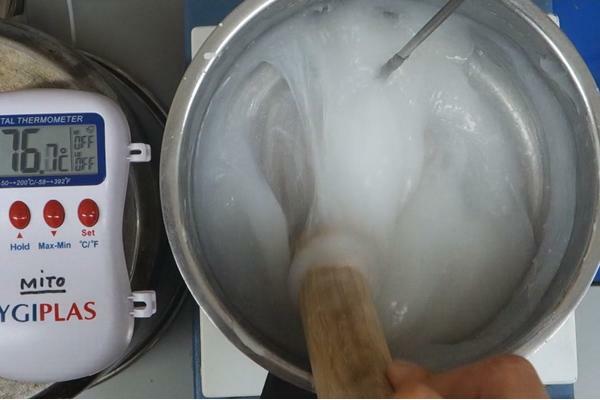 After further analysis 9 key parameters were identified that varied across recipes: starch source, pre-soaking time, starch to water ratio, cooking method, cooking time, temperature setting, sieving & kneading, cooking dilution and storage time/method. The subsequent paste cooking experiments were based on variations of these parameters and not on exact replication of the collected recipes. 3. How Hot is Hot? The vast majority of recipes collected only described the settings used to cook paste in very qualitative terms. But how does "low heat" on a gas stove compare to "200 C" on a hot plate or to "30 seconds at full power" in a 1000W microwave? To compare recipes, I needed a common metric: the temperature reached by the paste mixture during the cooking process. To do so, I established 22 calorimetric profiles by continuously monitoring the temperature of a paste preparation as it cooked at different settings on range of cooking implements (hot plate, kitchen hob, electronic sauce maker and microwave). 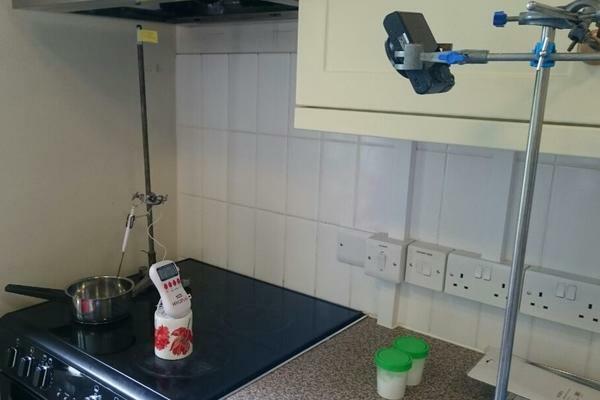 Figure 2.1: Measuring calorimetric profiles on a kitchen hob. Map "settings" to actual paste temperature. Understand how paste temperature evolved through the cooking process. Through literature research I identified that the food industry had extensively studied the cooking profiles of alimentary starch preparations using dedicated instruments such as the Rapid Visco Analyzer (RVA). 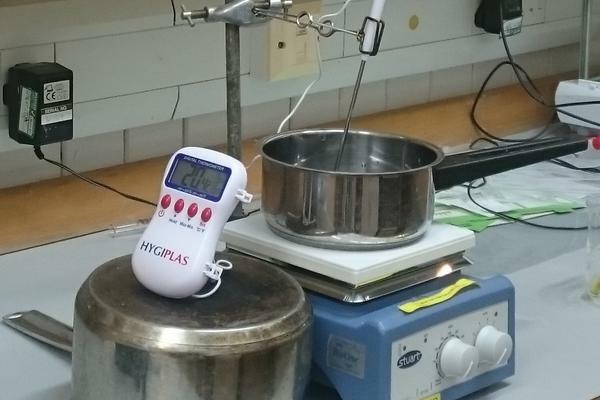 This instrument allows to accurately measure the evolution of the mixture's viscosity under carefully controlled time, temperature and stirring rate conditions. 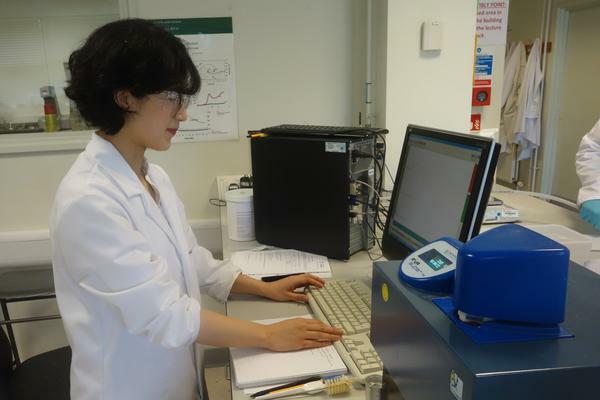 As no such profiles existed for WSP (which are significantly different from food industry starch preparations), a set of dedicated experiments was conducted with the kind support the food chemistry laboratory at University of Nottingham. 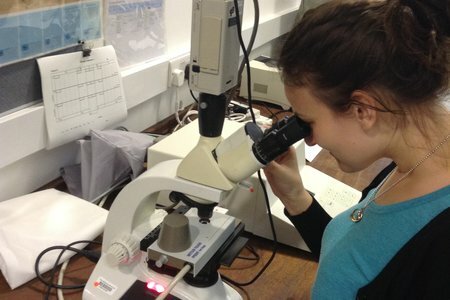 As this is the first attempt in conservation field, this research was gratefully supported by an Icon Book & Paper Group CPD bursary in 2017. To compare pastes, I first had to cook the samples. Practical constraints did not encourage me to test all combinations of parameters. 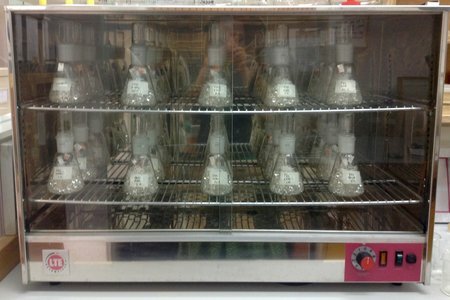 This would have led to more than 1900 samples and I may not have met my submission deadline! I decided on a much less exhaustive block experiment design, varying one parameter at a time around an arbitrarily chosen control recipe, which thankfully reduced my workload to 19 batches. All batches were cooked under similar environmental conditions - with a room temperature in the 20℃ to 25℃ range and a relative humidity of 40% to 55% . Peak cooking temperature (6) 60℃, 65℃, 70℃, 75℃, 85℃ and 90℃. Each cooking experiment was fully documented, digitally filmed and the mixture temperature continuously recorded. This allowed to compare the evolution of the mixtures' appearance and identify clear visual indicators to practically guide conservators when preparing paste. 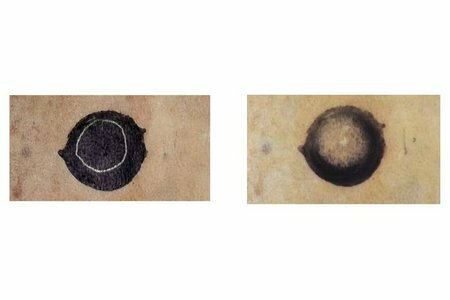 Seven visual stages were identified and labelled: Initial, Thickening, Jelly Lump, Creamy, Matte, Shiny, Translucent and Runny stages. Some batches went through all stages, some stopped partway through the sequence and a few skipped stages. This was later closely correlated to the properties/qualities of the paste. Each of the successful 18 batches (one was severely undercooked and unusable) was then separated into 4 samples, to match 4 dilution grades in water: non-diluted, 1:0.5 1:1, 1:2 with water. As I could not find any standard or objective criteria to assess the quality of WSP, the question was then how to compare quality of the resulting 72 samples? How I identified criteria and performed the testing is the subject of my next blog post: The Sticky Issue of Making Paste (Part 11).